So. . . I may be late to the TED-Ed game. I’ve been familiar with TED Talks for a few years now, but this new(ish) TED-Ed resource will blow your mind. from the website: TED-Ed is a free educational website for teachers and learners. We are a global and interdisciplinary initiative with a commitment to creating lessons worth sharing. Our approach to education is an extension of TED’s mission of spreading great ideas. Within the growing TED-Ed video library, you will find carefully curated educational videos, many of which represent collaborations between talented educators and animators nominated through the TED-Ed platform. This platform also allows users to take any useful educational video, not just TED’s, and easily create a customized lesson around the video. Users can distribute the lessons, publicly or privately, and track their impact on the world, a class, or an individual student. Check out the “About” tab to know more about how lessons are created and how teachers can customize lessons. 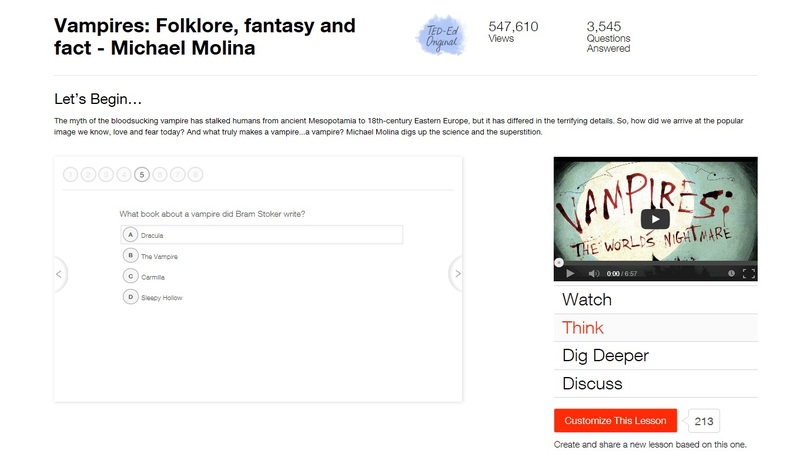 Under the lessons tab, you can filter by category (check out that list – there’s even “Literature and Language”! ), content, student (you can choose high school so things are the level you want), or duration. It’s quite user friendly. 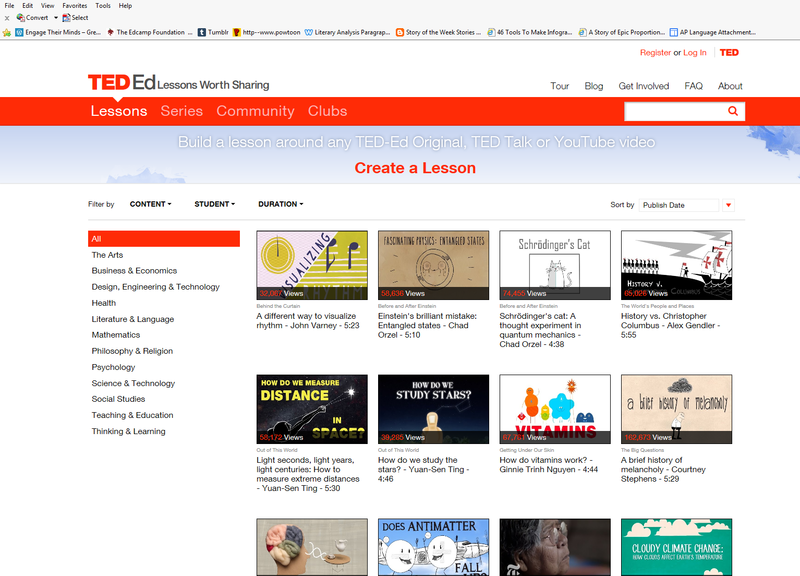 So browsing lessons is the first great thing about TEDEd (some designed around TED talks we know and love). They’re done in such a way that you could take students to a computer lab with headphones (they can bring them . 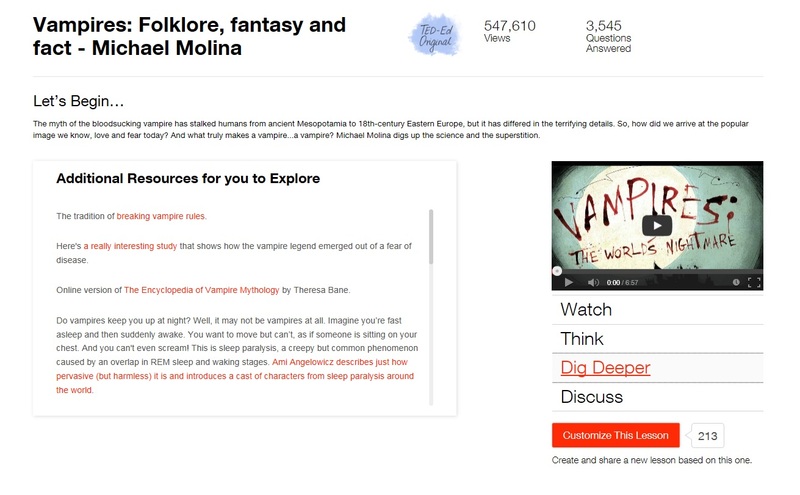 . . they all have them) to watch, answer questions, and explore the resources in the “Dig Deeper” tab OR they could be done in home. Students could choose which they want to learn more about (something like this might work great if you want to work on inquiry-based learning or #geniushour. . . more about that soon). As you move through the tabs on the right, something new appears on the left. Each lesson was created by someone else, so the nature and number of the questions will vary. Notice on the right-hand side that you can also choose to “customize” this lesson. That’s pretty rad. 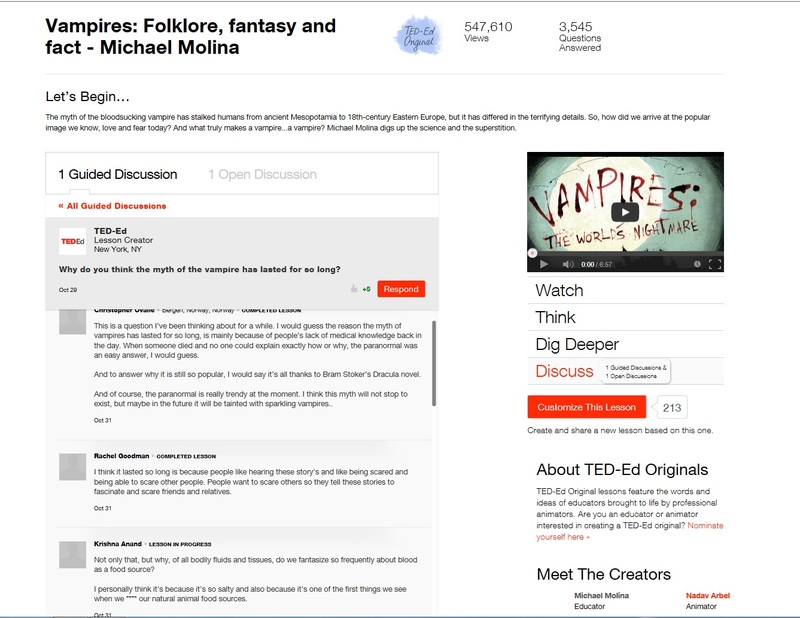 You can change or modify lessons or create your own based on a TED Talk! Students could complete something you designed or go and explore something another educator/animator did. This engages students in TED Talks in a way that simply watching it couldn’t. And the options for TEDEd-inspired performance assessments and projects after a student-directed research assignment are exciting! I actually thinking using these as part of a student-directed research project might be just the solution for PARCC testing disturbances. It would mean smartphone use and maybe some after school and at home work for internet access though. But of course, you can use them anytime! As always, if you want to brainstorm other ways to bring this to your classroom and./or want to flesh out an idea presented here, don’t hesitate to let me know. 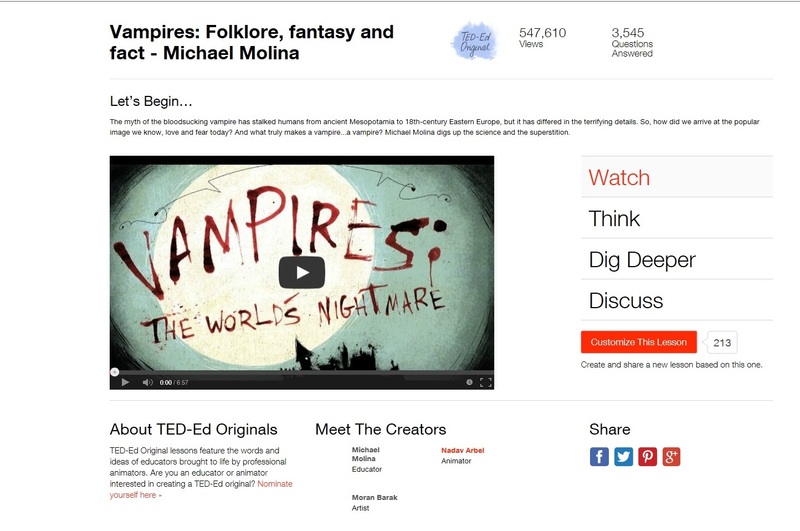 I would love to collaborate with TedEd! Check out this short 12 minute TED Talk by Andrew Fitzgerald, an editor who discusses the new frontier of narrative writing: Twitter (Thanks to Jordana for sharing this with me!). In it, he discusses the idea of fictional characters engaging in the real world (like the characters of West Wing, who all have Twitter accounts) and flexible identities available on Twitter. There are so many ways we can bring these narratives into the classroom–as small, daily assignments or larger assessments. “Tweet” original stories: Throughout a narrative reading and/or writing unit, have students build their own stories twitter-post by twitter-post, meaning, they “tweet” a part of their story as a warm-up and/or closing each day. They can apply what they learned about narratives or about narrative writing in class that day or the day before to their Twitter serial-stories. Towards the end of the unit, they could use those as fodder for a full story or performance assessment. Apply narrative knowledge by analyzing Twitter fiction: Students find an example of Twitter fiction and watch it unfold live or scroll back through it. They can apply what they know about narrative to analyze this new narrative . . . maybe even study it as a genre! What’s different about this when compared to a story or novel? What characteristics are unique to Twitter fiction? Why does the author make the choices (s)he does when tweeting certain information at certain times and making the reader wait at other points? 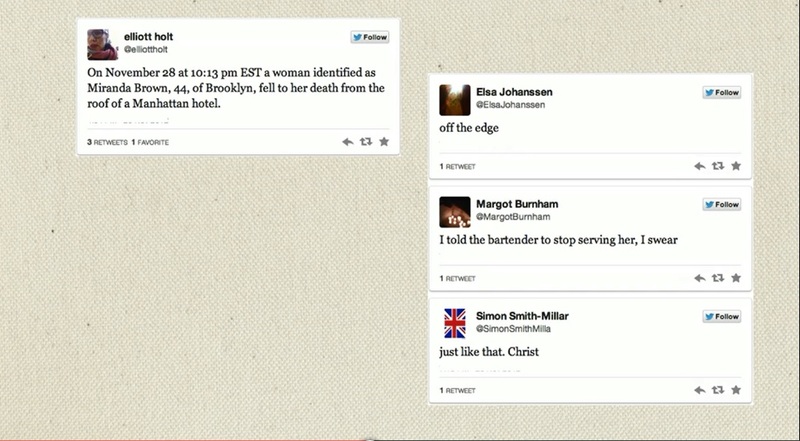 (RL.12.5) What does suspense look like in Twitter fiction? This could be a really fun performance assessment where students go out and study and analyze a new kind of narrative.